Ahead of their headline 2015 UK tour, Getintothis’ Adam Lowerson caught up with the Sundowners’ Niamh Rowe to discuss their eponymous debut album, working with The Coral and protest music. “My dad said to me once something that has always stuck with me – ‘Once you’re awake you can never go back to sleep’,” says Niamh Rowe, lead vocalist and guitarist of the Sundowners. 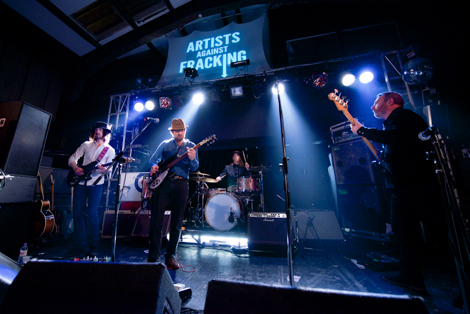 They’re a band who have been actively involved in spreading the word about the Liverpool anti-fracking movement over the past 12 months, hosting a gig to raise awareness at District in the summer, as well as taking part in several peaceful protests and marches. Even with all of this going on the fivesome have still managed to record their much anticipated debut album, which will be released early next year on Skeleton Key records. The self-titled record has been in the works for well over year now, and Rowe is relieved for it to be finally seeing the light of day. “It’s been a long time coming. It’s definitely a relief, but exciting at the same time,” she says. If you’re a regular on the Merseyside music scene you’ll be well aware of the Wirral rock ‘n’ rollers, who have been around for a few years now waiting for a breakthrough. Some of the tracks from the LP may also feel familiar, such as Hummingbird, which has been a mainstay in the band’s set for a while now. But the band knew that they had to do something different to keep people interested and give the older tracks a new feel. Rowe explained, “We remixed Hummingbird for the album because we used phase pedals on a lot of the tracks to give them that psychedelic sound. Hummingbird along with tracks such as the lead single Into The Light and Who We Are, which you can hear exclusively below, bring together a spectrum of influences from west coast harmonies to 1960s psych-pop and the co-vocalists and songwriters Rowe and Fiona Skelly’s mutual love of Stevie Nicks. The tracks have an otherworldly feel to them, something which Rowe puts down to the melting pot of inspiration coming from the five members, with even Krautrock finding a place on the album. Niamh said: “Our drummer Jim [Sharrock] has kind of got a Krautrock feel about his playing. You’ll notice his drum parts have got that air about them. “But me, Fiona and Alfie who write the songs are into the general lyricists of time like Bob Dylan. Stevie Nicks as well, she’s a brilliant songwriter and definitely influences me and Fiona. 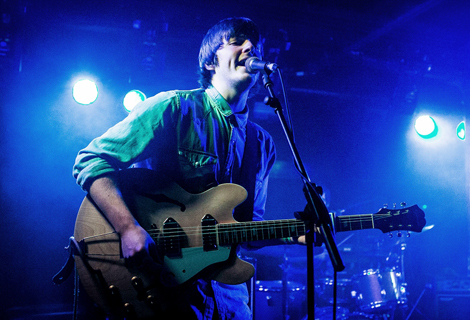 There’s a clear influence from The Coral, which is to be expected as James and Ian Skelly, brothers of the Sundowners’ Fiona and Alfie were on production duties. Perhaps the most interesting aspect of the Sundowners however is not just the music, but the aforementioned involvement with the anti-fracking movement. It’s unusual in music these days for a new band to be so politically switched on and publicly align themselves with a certain cause. In fact it’s a rarity in youth culture in general, and the work that Rowe and Skelly have done in raising awareness of the issue of fracking on Merseyside with their gig at District, which was backed by Yoko Ono, is massively impressive. Having become frustrated with the lack of coverage the plans to frack in Liverpool were getting, Rowe felt the band gave the perfect platform to get the message out there. Their passion for the cause is refreshing and will certainly do them no harm when winning over new fans. However, the publicity from being involved with the events isn’t important to Rowe, which is something she feels is a problem when such motives arise in popular culture. She added: “We’re not doing it to make a name for ourselves, we’re doing it because we care about the environment and where we live. There’s a lot of protest songs and stupid Christmas stuff like that Bob Geldoff [with Band Aid], who are kind of just raising their own profiles. So maybe we shouldn’t expect a Sundowners anti-fracking anthem to be battling it out with the likes of Geldoff and Co. for the Christmas Number One spot anytime soon, but we can expect them to keep spreading their message and doing what they can to help. In the meantime, the music they’re making is enough to win them popularity, and with a nationwide headline tour recently announced for 2015 including a show at the Kazimier on February 20, they’re certainly a band with a big future ahead of them. The Sundowners album is set for release on January 26 via Skeleton Key records. Listen to an exclusive stream of Who We Are below.